Any art enthusiast with a passion for the natural world should consider adding a Hamish Mackie work to their collection. 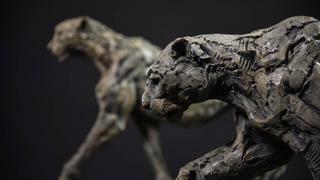 The British wildlife sculptor is acclaimed by critics for his ability to not only capture the outward appearance of the animals he sculpts, but also to express the spirit of life within them. 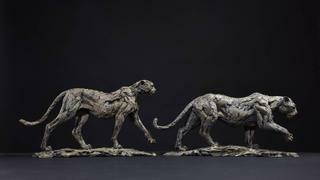 His bronze and silver pieces show instinctive animal behaviour; a moment interpreted by the sculptor who then manages to convey the beauty, grace, strength and soul of the animal subject. “You should be able to look a wildlife sculpture in the eye and see life,” Mackie says of the intention behind his pieces. Mackie has honed his talent for realistic interpretation through years of research in various corners of the globe. The sculptor believes that the disposition of a predator in the wild is very different to that of one held in captivity, and it is the close observation of his subject in its natural habitat that has informed his work. 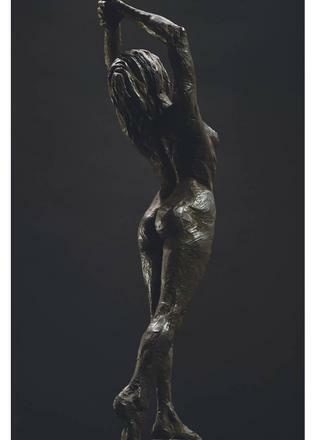 In recent years the sculptor has travelled to Australia, across Africa, to the Middle East, Russia and to India. He travels with his camera and specially adapted studio box, observing, sculpting and recording as much information about his subjects as possible. More recently, he has started to use trail cameras enabling him to capture more intimate shots of wildlife that are rarely, if ever, seen by the human eye. Mackie brings this vital energy into the tactile process of modelling and the transformative alchemy of lost wax casting. He aims to create a balance of tension and softness, through using bold strips of clay that are gouged or flattened, leaving the marks of his fingerprints in place. This expressive handling engenders a powerful sense of impending action in his animal sculptures. The pieces are then cast in either bronze or silver. For this Mackie works with his long-term collaborator Simon Allison and together the duo have perfected the process of ensuring that every thumb mark, fragile feather or tiny detail of the piece is captured in casting. 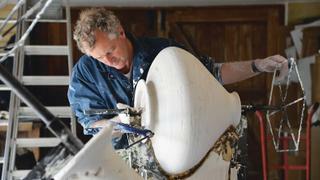 Each sculpture takes an average of four months to be sculpted, moulded and then cast using the lost wax method, such is the highly-skilled process. In 2013, Mackie was commissioned by the Berkeley Group to sculpt six life-and-a-quarter size horses for the piazza of the Goodman’s Fields development in the City of London. For this project, in 2016, the sculptor was granted the prestigious Public Monuments and Sculpture Association’s Marsh Award, for Excellence in Public Fountains. While he is undoubtedly drawn to the animal world and its inhabitants, it is not only wildlife that Mackie sculpts. Keen to challenge himself artistically, he has been inspired by the ancient wall paintings in Lascaux in the Dordogne region of France, by ancient relics seen in museums visited on his travels across the globe and by the human body. In 2015, Mackie made three pieces based on the female form, all of which were created by working with a life model in his studio. According to Mackie, unlike watching a wild animal in its natural habitat when there is no control over movement, he was able to give guidance to his subject, resulting in an altogether different but no less dynamic artwork. More recently Mackie has made River Bed 2017, a wall hanging inspired by Millais’ famous painting, Ophelia. There is no doubt that Mackie is a master animalier, but it is also his enthusiasm for a new challenge and his ability to work as part of a team, to any brief at any scale, that makes him a perfect choice for a commission for a superyacht.